This simple but beautifully graphic mosaic of ceramic tiles adorns the exterior wall of the Bacardi Distillery in Puerto Rico. 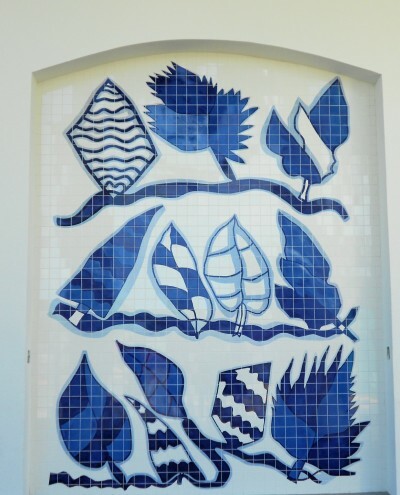 Photos of thier National Headquarters in Bermuda also show a similar blue and white mosaic on an exterior wall. The first thing that came to my mind was what a wonderful idea for a “Pieced Quilt”. The use of various shades of blue tiles gives it depth and texture – a real achievement on a shiny ceramic surface, hey.